Patented designs fit multiple sizes of round cat, and dog food cans. Ear tabs allow for easy removal. Pre-loaded clip strip. 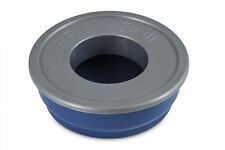 Patented Designs Fits Multiple Sizes Of Round Cat, And Dog Food Cans. This is prohibited by law. The filters are for use with Petmate Purifying Pet Fountain. Cat Mate Pet Water Fountain Drinking Bowl Cats Dogs Cat Mate 335 Cat Mate Water Fountain Your pets health and vitality require adequate water consumption. Our carefully developed cat water fountains, unique designmaximises the appeal of drinking with plenty of water movement to ensure naturally oxygenated, cool water throughout the day. ---Multi-height drinking levels ---2 litre (70 fl. oz.) water capacity ---I.P.S. (Isolated Pump System) for super-quiet operation ---Polymer carbon filter for water purification (replacement cartridges available) ---Easy to clean, dishwasher-proof bowls ---Suitable for cats and small dogs. Your pets will love the clean, fresh flowing water the Cat Mate Fountain provides. The Cat Mate Fountain is exceptionally quiet in operation and maximises the appeal of drinking with its multi-height drinking levels. ROUNDED EDGES…. Discourages pets from chewing the bowl. FINGER CUT OUTS…. 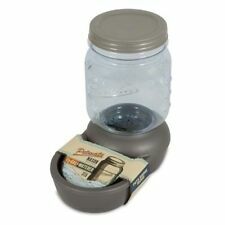 Cut outs allow for easy pick up and for move bowls minimizing spills. Petmate Ultra Lightweight Bowls and made with Microban Material that will help prevent the growth of Odor and Stain causing Bacteria. 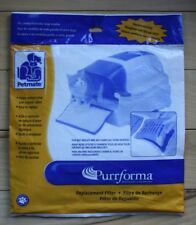 Petmate Purifying Pet Fountain Replacement Filter - 2 pack. NEW FREE SHIPPING. Condition is New. Shipped with USPS First Class Package. Our carefully developed, unique drinking fountain design is exceptionally quiet in operation and maximises the appeal of drinking with its multi-height drinking levels. Cat Water Fountain Drinking Bowl Cats Dogs Easy to clean dishwasher-proof bowls. This pet waterer circulates the water through its carbon filter, reducing odour and improving taste. It has a pump powered from mains electric. The pet fountain is proven to help cats with urinary tract disorder. 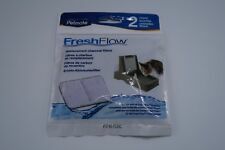 Genuine Petmate Fresh Flow Filters (3) Replacement Charcoal Filters. Condition is New. Shipped with USPS First Class Package. Perfect for multiple cat or dog households, this award-winning fountain features continuous circulating water & a unique, patented no-splash water-slide. The re-circulating flow & filter provides naturally cool & oxygenated water, attracting pets to drink more in order to help promote their health & well-being. Model Number: 24989. Manufacturer Part Number 24989. Product Model 24989. Prior to use, be sure to remove the outer plastic covering on the filter and rinse under cold water. Manufacturer: PETMATE. Manufacturer PETMATE. Pet Mate cat drinking fountain complete with pump and low voltage power supply.Simply plug in and fill with water.The unit houses a filter which is a replaceable cartridge to keep the water clean and fresh and is readily available. Three stage drinking levels and the anti splash design ensure no mess. Dishwasher proof bowl and the cable is three metres in length.manufacturer warranty does not apply. Fits Jumbo and Extra-Large Models. PETMATE 24847 Bleached Linen PETMATE DELUXE FRESH FLOW CAT BOWL 108OZ BLEACHED LINEN 15.37 X 10.18 X 7. Model Number: 24847. Manufacturer Part Number 24847. Product Model 24847. Manufacturer: PETMATE. NOTHING FANCY OR COMPLICATED HERE. Cat Water Drinking Fountain. Our carefully developed, unique design maximises the appeal of drinking. Multi-height drinking levels. I.P.S. (Isolated Pump System) for super-quiet operation. Your pet's health and vitality require adequate water consumption. Easy to fit. Best Quality. Money back. 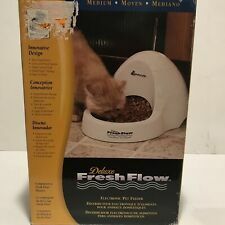 Petmate Fresh Flow II Fountain 50 oz. Bleached Lenin. Two replaceable charcoal filters keep water cleaner. Product Features. Ne w in b ox. Filter strap included to help hold filter in the cap. Fits all sizes of Fresh Flows. Charcoal filter removes contaminants from your pets drinking water. When you complete this section, build the single-page site using Simple HTML. After you Build this page, the HTML source code is automatically placed on the clipboard. This is our #1 goal and we will do anything reasonable to achieve that.